7.78 billion docking jobs have been submitted. 7.51 billion docking jobs have been submitted. 7.24 billion docking jobs have been submitted. 6.79 billion docking jobs have been submitted. Dockings against the capsid proteins (binding pockets 1 and 2) were the last jobs submitted. In total, we have submitted almost 5 billion docking jobs, which involved 427 different target sites. Our initial screens used an older library of 6 million commercially available compounds, and our current experiments utilize a newer library of 30.2 million compounds. We have already received approximately 4.6 billion of these results on our server (there is some lag time between when the calculations are performed on your volunteered machines and when we get the results, since all of the results per “package” of approximately 10,000 – 50,000 different docking jobs need to be returned to World Community Grid, re-organized, and then compressed before sending them to our server). Thus far, the > 80,000 volunteers who have donated their spare computing power to OpenZika have given us > 51,471 CPU years worth of docking calculations, at a current average of 64.5 CPU years per day! We have received 100% of the results for Experiments 1A, 1B (NS5 class), 2A, 2B, and 2C (NS3 helicase class). We have received 46% of the results for Experiment 3A (NS1 class). 3A = we have received 160 million out of 348 million. In total, we have submitted ~ 1.6 billion docking jobs, and we have already received ~ 1.1 billion results. The results from the first 3 experiments involve 84 different target sites (74 unique targets, mostly from Dengue Virus, HCV, Yellow Fever Virus, Japanese Encephalitis Virus and Zika Virus). Thus, as of June 19th, 2016, we have received 254 million different docking results (in approximately 2 months). The non-structural protein 5 (NS5) of flaviviruses is the most conserved amongst the viral proteins. The N-terminal domain of NS5 possesses the methyltransferase and guanylyltransferase activities necessary for forming mature RNA cap structures. The best NS5 homology model for ZIKV was built using the full-length Japanese encephalitis virus NS5 as a template (PDB ID: 4K6M). The first binding site for NS5 is related to the ligand 2′-deoxy-2′-fluoro-2′-methyluridine 5′-(trihydrogen diphosphate) position (PDB ID: 4WTG). Thus, as of July 19th, 2016, we have received 99.75% of the results for Experiment 1A, corresponding to 125,688,000 docking jobs. These images below show a “positive control” experiment. This experiment demonstrates that we can accurately predict/reproduce the specific way that a known inhibitor binds to this important drug target, NS5 class. The second binding site of NS5 is related to the ligand S-Adenosyl Methionine (SAM) position in the binding site. Thus, as of July 19th, 2016, we have received 87% of the results for Experiment 1B, corresponding to ~ 42 million docking jobs. Experiment 2A = Virtual Screening against the NS3 helicase class (first binding site). The NS3 helicase domain exhibits intrinsic nucleoside triphosphatase activity (upon stimulation by RNA), which then provides the chemical energy to unwind viral RNA replication intermediates to facilitate replication of the viral genome together with RNA-dependent RNA polymerase (NS5). Given its essential role in genome replication, ZIKV NS3 helicase could be an attractive target for drug development against ZIKV. The NS3 helicase structure revealed a conserved triphosphate pocket critical for nonspecific hydrolysis of nucleoside triphosphates across multiple flavivirus species. A positive-charged tunnel has been identified in the viral helicase, which is potentially responsible for accommodating the RNA. The first binding site of NS3 is related to the nucleic acid binding site. Thus, as of July 19th, 2016, we have received 26% of the results for Experiment 2A, corresponding to ~ 86 million docking jobs. The ZIKV NS3 helicase structure is available below. ZIKV NS3 helicase with three candidate inhibitors selected by VS, shown as solvent-accessible surfaces, with different shades of green. The identification of these candidates and the video were made by Dr. Alexander L. Perryman. The second binding site of NS3 is related to the ATP binding site. New NS3 helicase crystallographic structures were solved (PDB ID: 5GJB, 5GJC, 5JRZ). The dockings were performed for both binding sites. Glycoprotein NS1, present in all flaviviruses, appears to be essential for virus viability. This protein contains two conserved N-glycosylation sites and 12 invariant cysteine residues. The dockings were performed for five binding sites. New NS3 helicase crystallographic structures were solved (PDB ID: 5K8L, 5K8I, 5K8U, 5K8T). The dockings were performed for both binding sites. NS2B-NS3 protease is responsible for all cytoplasmic cleavages including at junctions between NS2A/NS2B, NS2B/NS3, NS3/NS4A and NS4B/NS5 proteins and within the capsid, NS2A and NS4A proteins. Similar to NS3-NS4A protease from hepatitis C virus, the flavivirus NS2B-NS3 protease is essential for the virus replicative cycle, and thus constitutes an ideal target for antiviral drug development. NS2B-NS3 protease also suppresses the immune response by cleaving stimulator of interferon genes (STING) in DENV, triggers apoptosis via activating caspases in WNV, and induces neurotropic pathogenesis by inhibiting activator protein 1 (AP-1) in JEV. New NS3 helicase crystallographic structure were solved (PDB ID: 5MFX ). The dockings were performed for both RNA and ATP binding sites, against ZINC15 Library (30.2 million). 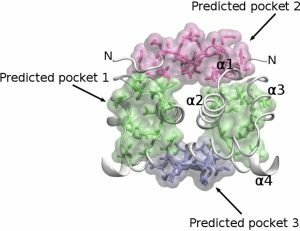 A new grid box (potential allosteric extension of the ATP site) was generated based on the AutoLigand results of snapshots from NS3 helicase Molecular Dynamics simulations. Docking calculations against ZIKV NS5 crystal structures (PDB ID: 5kqr, 5kqs, 5tfr), HCV (PDB ID: 4wtg, 4e78) and DENV (PDB ID: 4v0q, 4v0r) were performed for both SAM and active sites, against ZINC15 Library (30.2 million). Docking calculations against ZIKV capsid protein crystal structures (PDB ID: 5z0r, 5z0v), WNV (PDB ID: 1sfk) and DENV (PDB ID: 1r6r (RMN)) were performed for binding pocket 1, against ZINC15 Library (30.2 million compounds). Docking calculations against ZIKV capsid protein crystal structures (PDB ID: 5z0r, 5z0v), WNV (PDB ID: 1sfk) and DENV (PDB ID: 1r6r (RMN)) were performed for binding pocket 2, against ZINC15 Library (30.2 million compounds). Docking calculations against ZIKV capsid protein crystal structures (PDB ID: 5kve, 5kvf, 5kvg, 5gzn, 5lbs, 5gzo, 5lbv, 5jhl, 5jhm, 5kvd, 6dfi) and DENV (PDB ID: 3j2p, 3uaj, 4uta) were performed against ZINC15 Library (30.2 million compounds). Docking calculations against ZIKV NS1 protein crystal structure (PDB ID: 5k6k) and the conformations obtained from molecular dynamics simulations were performed against ZINC15 Library (30.2 million compounds). We performed the docking calculations using the glycosylation pocket N130 (site 1). Docking calculations against ZIKV NS1 protein crystal structure (PDB ID: 5k6k) and the conformations obtained from molecular dynamics simulations were performed against ZINC15 Library (30.2 million compounds). We performed the docking calculations using the glycosylation pocket N270 (site 2).